If you’re looking for a rollicking good time, a clean read with some mystery and some wonderful recipes thrown in for your enjoyment, pick up Death on Eat Street. It’s a first class dish and the start to a brand new series. Recommended reading at its finest. 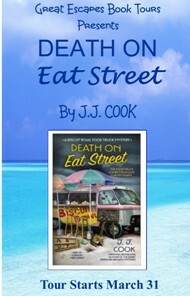 Death on Eat Street has all the elements for a top notch beach read or just a book to relax with and enjoy. J.J. Cook has cooked up a real winner with this series debut. I read it all in one serving, I mean sitting. I could not put it down!! 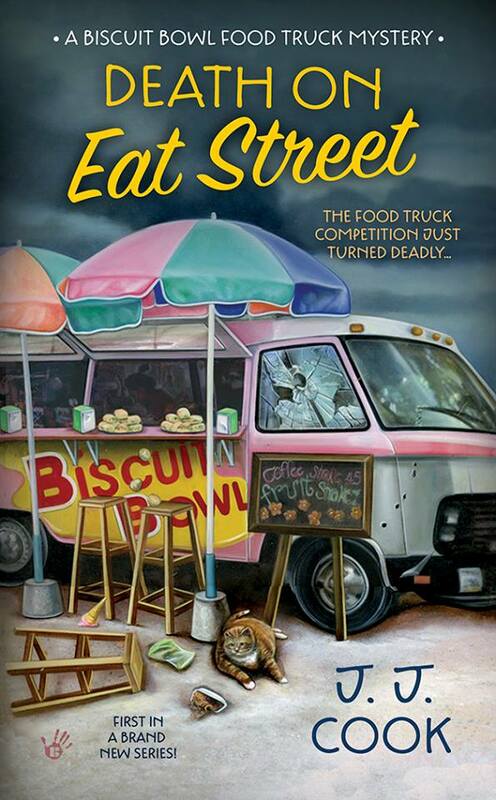 Death on Eat Street by JJ Cook is the first book in their awesome new series, Biscuit Bowl Food Truck Mysteries. JJ Cook has another fabulous series underway. I thoroughly enjoyed the whole book from start to finish. Death on Eat Street is a delectable mystery that will have you craving one of Zoe’s famous biscuit bowls and I can’t wait to see what is in store for Zoe next. This was a really fun and fast paced mystery centering on two of my favorite things: food and the South! I love all cozy mysteries, but as a foodie, I was particularly drawn to this one for its story line and Southern setting. This was a great book. Although I am a cat lover and any book that has a cat with the kind of personality that Creme Brulee has will be one of my favorites. This is a fantastic new culinary cozy series with a feisty, determined protagonist who I look forward to watching make her dreams come true. Filled with diametrically opposed characters…Death on Eat Street is a solid start to a new series. …a cozy mystery with a story as satisfying as the biscuit bowls she serves….with savory AND sweet fillings for one and all. If you’re looking for a great reading escape for your next afternoon or weekend break, definitely consider this tasty treat. Zoe Chase always wanted to own her own restaurant—but first, she’ll have to serve up a heaping helping of meals on wheels, with a side of mystery. When she’s once again passed over for a promotion at work, Zoe decides to take the big leap and go for her dream. She quits, gives up her fancy digs, and buys a fixer-upper diner in a shady part of town. To keep above water during the renovation, she buys a used food truck to serve the downtown and waterfront of Mobile, Alabama. Zoe starts to dish out classic Southern food—but her specialty is her deep-fried biscuit bowls that blow traditional bread bowls away. After a promising start, things start to go downhill faster than a food truck without brakes. First, someone tries to rob the cash register. Next, Zoe is threatened by the owner of a competing food truck for taking their spot. And when the owner ends up dead inside Zoe’s rolling restaurant, Zoe and her sole employee, Ollie, find themselves hopping out of the frying pan into the fryer. They need to find the real killer, before both of them get burned. 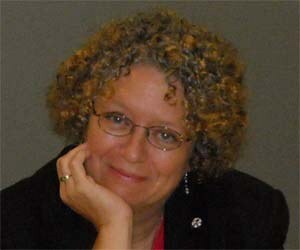 J.J. Cook writes award-winning, bestselling mystery fiction as themselves, Joyce and Jim Lavene, and Ellie Grant. They have written and published more than 70 novels for Harlequin, Berkley, Amazon, and Gallery Books along with hundreds of non-fiction articles for national and regional publications. They live in rural North Carolina with their family. Visit them at www.jjcook.net. Each participating blog can give away 1 print copy. It hadn’t been more than thirty minutes or so since I’d climbed out of the food truck. How did Terry get there after me? And what was he doing here? Had he followed me back to give me more grief over parking in “his spot” on Dauphin Street? “What’s up out here, young ’un?” Ollie came out of the diner, still holding the sword. Dead? That made even less sense to me. Maybe I was too tired to think straight. 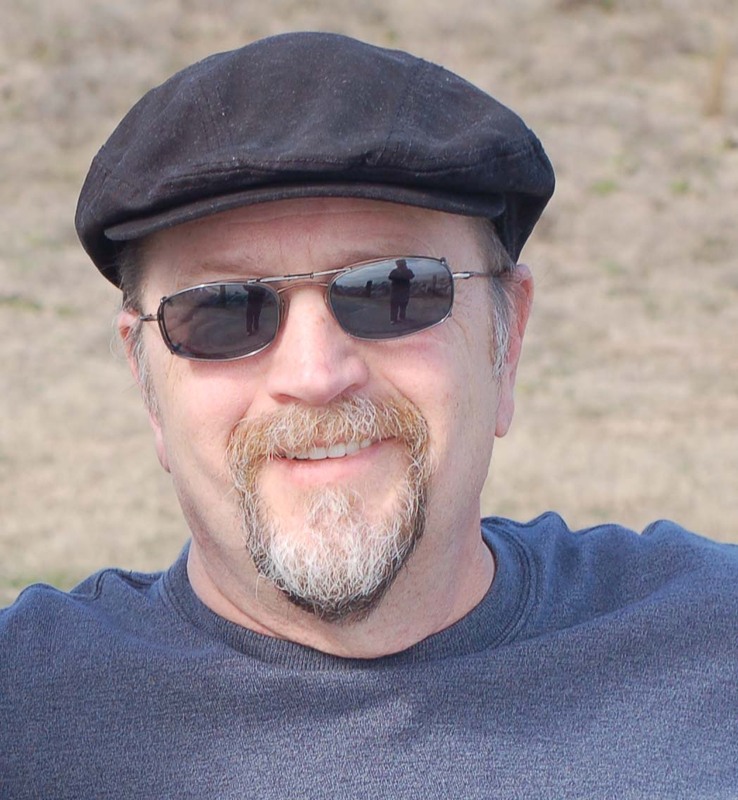 Why was Terry—alive or dead—in my food truck? I knew he was wrong. If something had happened to Terry, regardless of how he got into the Biscuit Bowl, the police needed to be informed. If there was one thing I knew besides cooking, it was the law. My mother was one of the most prominent attorneys in Mobile. There was even some talk of her getting a judgeship. She’d fed me the law with my pureed carrots and pears when I was a baby. She’d hoped I was going to follow in her footsteps someday. I was kind of a disappointment in that area. Still need to sign up to be a Tour Host so that emails about new tours can be sent right to your inbox? Thanks for everything, Lori! You are the best!